Telehealth and Medicine Today (TMT), is an open access online, international peer review journal where strategic thought leaders, new-era practitioners, and future society stakeholders converge to unveil solutions in a new health and technology sector. TMT assists building knowledge and consensus for launching and scaling delivery services to achieve sustainable outcomes. The journal publishes research articles and commentaries related to innovations in patient-centered care, advances in program implementation, outcomes, process improvement, financial impact, and clinical research applications across the care continuum in a new era of value based care. A world-class peer-review board endeavors to offer rapid, peer-review (14 days), and includes constructive commentary to strengthen work. The online only journal is published on a continuous basis in order to accelerate sharing of rigorously vetted theoretical and experiential knowledge required for a growth sector. The audience for Telehealth and Medicine Today includes leadership hospitals and medical research centers, payer organizations, researchers, innovators, medical directors, IT/IS, healthcare providers, and academicians. In addition, biopharma and device companies are represented. Anyone with an interest in can freely access Telehealth and Medicine Today for information on the implementation and advances on the horizon in the specialty. We are excited to share the ATA has endorsed the peer reveiw journals Telehealth and Medicine Today and Blockhain in Healthcare Today. “Blockchain is a key driving force behind maintaining accurate, actionable healthcare data – and is an important component of where we’re headed in telehealth. The ATA is delighted to collaborate with Partners in Digital Health, as the benefits of blockchain technology are critical to our members’ success in the future,” stated Ann Mond Johnson, CEO, ATA. “Pushing the confines of pragmatic healthcare innovation and academic publication practices, these journals fill gaps with editorial missions poised for the next frontier in health and care around the world,” stated Tory Cenaj, Founder, Partners in Digital Health. Stay tuned for more news and initiatives in the near future...! We invite to you to submit a manuscript to Telehealth and Medicine Today (TMT) peer review journal, dedicated to virtual care, telecare, telemedicine, and converging innovative technologies in healthcare. TMT - a leading open-access international peer-review journal for strategic thought leaders, new-era practitioners, and future society stakeholders engaged in global innovations fostering ecosystem efficiencies in virtual care, telecare, and telehealth utilizing evidence-based outcomes. The journal is published on a continuous basis in order to accelerate sharing of rigorously vetted theoretical and experiential knowledge required for an exciting growth sector. Authors can include relevant software code and data in the peer review process by uploading it to TMT’s Code Ocean computational reproducibility workflow; and strengthen the validity, attribution, and trust-based reputation of their work with TMT’s ARTiFACTS.ai service option, a purpose built blockchain-enabled platform for academic and scientific research and development. A no-deadline, continuous, two-week submission-to-decision turnaround by a world-class peer-review board includes constructive commentary and offers the opportunity for authors to strengthen their work. Happy to help you join this exciting international community of innovations and ecosystem efficiencies in virtual care, telecare, telehealth, and converging technologies transforming healthcare. It's here...the #ConV2X TMT Podcast Issue is now LIVE!!! Partners in Digital Health, publisher of Telehealth and Medicine Today (TMT) has announced a partnership with Orvium, the first decentralized social platform for scientific collaboration, funding, and publications management based on blockchain and artificial Intelligence. TMT will be the first journal to run on the new Orvium decentralized platform. Headquartered in Tallinn, Estonia, Orvium is a new open-source decentralized platform which aims to revolutionize the speed with which the academic review process takes place, incentivizing peer review on the blockchain through tokenized economic and reputational rewards. With a team drawn from CERN, NASA, Amazon, Oracle, and others, Orvium uses several cutting-edge technologies, including blockchain and artificial intelligence, to drastically reduce the long and often costly process of having research published by traditional publishing houses. The project aims to make scientific data more accessible while giving researchers more control over their work and distribution rights. Telehealth and Medicine Today (TMT) is proud to welcome Dr. John D. Halamka MD, CIO of the Beth Israel Deaconess System and International Healthcare Innovation Professor at Harvard Medical School, as editor-in-chief. Dr. Halamka joins Dr. Jane Barratt, Secretary General, IFA, and Douglas Shinsato, Regent, University of Hawaii Board of Regents, and co-founder, Anthill Ventures. TMT continues to introduce many new facets to the journal’s profile since its launch as market disruptor in 2016. “Telemedicine and telecare will see exponential growth in the next year as healthcare systems adopt value based purchasing contracts and feel the urgency to improve quality while reducing costs. There is no better time to communicate the successes and failures of early adopters. TMT is the perfect place to share experiences with the community" stated Dr. Halamka. His biography may be viewed here. As a new journal launching on an open source peer review platform, TMT encourages scholarly manuscript submissions that present leading edge innovations and outcomes in a field perceived as tired by some. Although legislation lags, digital health and new technologies continue to fuel change in the healthcare sector. 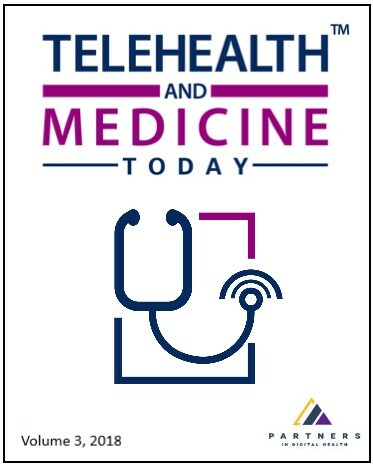 Telehealth and Medicine Today publishes articles on a continuous basis. As articles are accepted, they are published to ensure timely and accurate reflections of developments to assist building rapid consensus and adoption by the community. Read more TMT announcements here. TMT is an open-access publication and does not require subscriptions. We invite you to to receive announcements and updates on the latest publications as they are pushed live. To subscribe, it's FREE, click here. TMT now available on Alexa!!! TMT is now available on the Alexa Flash Briefing. Enable the TMT Flash Briefing on your Alexa App today! A special thanks to TMT intern, Alexander Zaleski - a most talented student at UCONN! Telehealth and Medicine Today has partnered with Code Ocean. Authors can now transparently share code associated with their research, with readers. Code Ocean, is a cloud based computational reproducibility platform, where researchers, engineers, developers, and scientists can upload code and data in any open source programming language and link working code in a computational environment within an article. The journal encourages authors and readers to share articles to broaden the sector's knowledge base. The initiative will also assist in reducing negative results, and ideally, accelerate time to market. The Code Ocean platform can also be used to include an executable copy of an author's code for the peer review process. Partners in Digital Health and Code Ocean will work towards the integration of Code Ocean into the journal submission and peer review workflow, where code and data is used. Authors will upload their code and data, within a cloud based computational environment, to create an executable “compute capsule” that can reproduce their results. A compute capsule will get a DOI and be embedded within the article upon the manuscript’s publication, enabling readers to view and verify the article’s results. Authors can upload and submit code and data associated with their article. Users can execute the code, view results, and modify the code to see how results change. Partners in Digital Health joins distinguished Code Ocean publishing partners De Gruyter, Cambridge University Press, Taylor & Francis, and BMJ Publishing Group. TMT is committed to advancing the use of blockchain in scholarly publishing. Under this partnership, ARTiFACTS and TMT will work together to integrate blockchain technology into the scholarly publishing workflow and collaborate on research to assess the effectiveness of the technology as a tool to improve speed, collaboration, access, transparency, and attribution in scholarly research. TMT will make its content available on the ARTiFACTS platform and will also provide access for its author/researcher community to start using the platform to establish proof of existence for research outputs, share research artifacts, and provide and receive immutable attribution in real-time during their research. Authors will benefit from the ability to easily and securely share in-process work to speed collaboration and enhance their reputation as research is conducted.